On Sunday, EA Sports released ratings for its upcoming Madden 15 game for all teams in the NFC and AFC North divisions, including the Cincinnati Bengals. 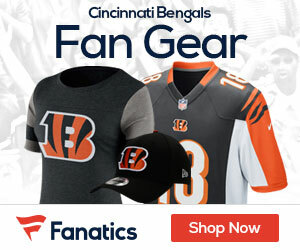 The Bengals check in with an overall rating of 86, best in the AFC North, and two points better than the Baltimore Ravens. The Pittsburgh Steelers (78) and Baltimore Ravens (75) round out the division. While it’s no surprise that the defense’s top-end talent outranks the offense, the fact that half of the team’s top-10 players are on the offensive side of the ball was a bit of a shock. 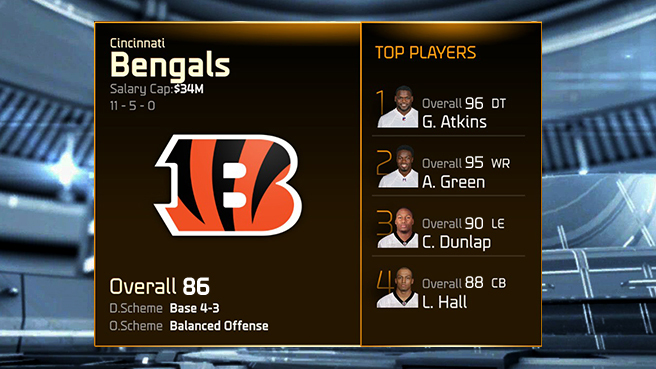 Cincinnati’s top player is defensive tackle Geno Atkins, rated 96 overall. He’s followed closely by A.J. Green at 95 overall. Carlos Dunlap (90), Vontaze Burfict (88), Leon Hall (88) and Reggie Nelson (85) round out the defenders in the team’s top 10. Joining Green among the offensive talents are Andre Smith (88), Andrew Whitworth (87), Andy Dalton (85) and Giovanni Bernard (84). Granted, these are all just numbers right now but in a football-starved world, these rankings are a small taste of all the fun that lies ahead. For the complete ratings, click here. Madden 15 launches for XBox One and PS4 on August 26. • Defensive back Onterio McCalebb, who ran a 4.28 40-yard draft at the 2013 NFL Combine, is Cincinnati’s fastest player with 98 speed and 87 acceleration. • Rookie Darqueze Dennard (78 overall) is already Cincinnati’s best man-to-man defender (rated 89). He’s one of four corners with an 85-or-better number in that category, speaking to the team’s cornerback depth. • Andy Dalton’s throw accuracy doesn’t really drop on deeper routes as he’s been rated 85 on short passes and 83 for both medium and long throws with an 86 throw power.